Recently finished reading “Saints and Madmen” by Russell Shorto. Very very interesting. Apparently there was a revolution to look at psychiatry through a more spiritual lens at one time, but I gotta tell you when I was in the hospital that was CERTAINLY not the case. Also the book delves into the topic of psychedelic drugs as well. Always find myself thinking of Rumi, when it comes to madness as a religious experience. Here is one for you. Light again, and the one who brings light. From the ocean-vat, wine-fire in each cup. Two or three of the long-dead wake up. Two or three drunks become lion hunters. Sunlight washes a dark face. The flower of what is true opens in the face. Meadow grass and garden ground grow damp again. A strong light like fingers massages our heads. No dividing these fingers from those. One level flows into another. Clothing tears inot the air. never so happy as out in the light. we’re pretty damn close, friends-wise. It’s my birthday today. Thank you to everyone who got me through the past four. this song is so good to slowjam to. genetics or you know. Other things. And proud of all of it. Now let’s just hope I inherited some good relationship skills from my other set of grandparents. Very soon this will be the longest relationship I have ever been in. Which means from here on out I’m in uncharted waters. I MADE THIS THING. 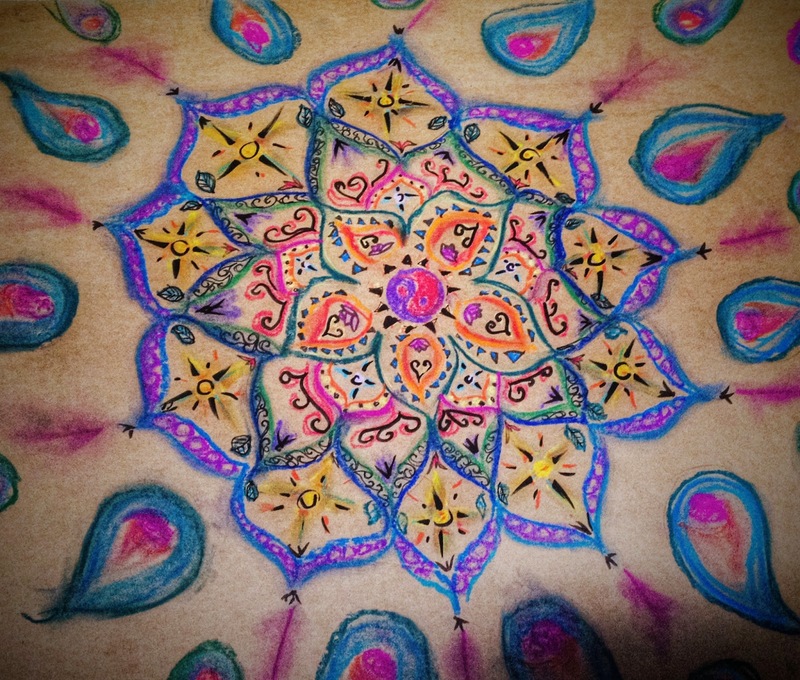 My friend saw it, and he’s all “Oh you made rangoli.” Which I have never heard of before, but so be it! People keep judging me for liking this song. I don’t care about them. time traveler. The past is looking more and more surreal every day. you ever find yourself crying on an examination table to a doctor who insists you’re only sad because it’s winter? you ever find yourself unable to even disagree because your confidence level is zero and you have de-evolved to something almost unrecognizable to anyone who knew you before? I alternate between writing these super happy nostalgic poems, and psychotic creepy ones. this first one is going to make you sick but it was fun to write. Also it is very inaccurate. I was a tomboy when I was a kid. I got into fights with boys. I was talking to my brother last night and it’s kind of sad when you’re surprised to see someone happy. I haven’t seen him happy since before I had my mental breakdown. That’s actually the one reason I regret well… what happened last year. All the hell it put him through. And my parents, grandparents, and cousins. I also regret how public, and facebook-documented it all was.